The San Diego Chargers will stay in the California city next season and hope to agree a new stadium deal, says owner Dean Spanos. The Chargers have until January 2017 to decide whether they will relocate to Los Angeles or stay in San Diego. Spanos has agreed to share a proposed stadium in the southern California city of Inglewood with the St Louis Rams. But he said: "My focus is on San Diego. This has been our home for 55 years and I want to keep the team here." Super Bowl 50: Who to support - the Denver Broncos or the Carolina Panthers? 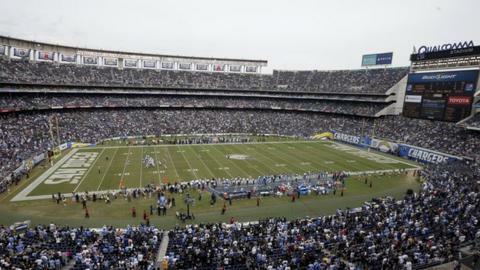 San Diego's 70,000-capacity Qualcomm Stadium was opened in 1967. It has held three Super Bowls, the most recent in 2003, and the NFL has told the Chargers they will not host another unless they move to another venue. BBC coverage: Watch live on BBC Two, online and BBC Sport app, listen on BBC Radio 5 live and follow live text commentary on the BBC Sport website.